The 49ers’ entire 11-player rookie draft class is officially set to report to training camp on Saturday. 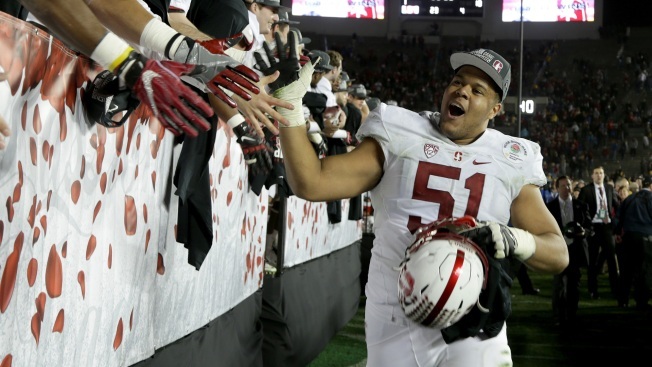 Guard Joshua Garnett, whom the 49ers selected late in the first round, was the last of the team’s draft picks to agree to his mandatory four-year contract, which has a total value of approximately $9.3 million. Joey Bosa, the No. 3 overall pick of the San Diego Chargers, is the only first-round pick who remain unsigned after Garnett and the 49ers reached their agreement on Friday night. The 49ers’ full squad, rookies and veterans alike, are scheduled to hold their first practice of training camp in Santa Clara on Sunday. Garnett, the No. 28 overall pick, is a front-runner to win a starting job at right guard. Even while he was unsigned, Garnett continued to work out daily at the 49ers’ training facility after conclusion of team’s official offseason program. Garnett was not allowed to participate in much of the 49ers’ offseason program due to NFL rules that prevent rookies from joining a team full time unless he has already graduated or until the conclusion of his school year. Garnett’s classes at Stanford wrapped up in time for Garnett to join the 49ers’ mandatory minicamp June 7-9. During the time Garnett could not participate in workuts with the 49ers, he was able to watch practices that were downloaded onto his team-issued iPad. Garnett said he reenacted everything the 49ers’ offensive linemen were doing for his personalized daily workouts at Stanford. Garnett is expected to compete for the starting job at right guard. “I think the biggest thing is he didn’t stand out,” 49ers coach Chip Kelly said after watching Garnett’s first week of practice. “Usually you stand out in those situations because you’re going the wrong way or the right guard’s going right and everybody else is going left. I think he fit in really well. The 49ers traded into the end of the first round to select Garnett with the No. 28 overall pick. The 49ers picked up the first-round pick of the Kansas City Chiefs, as well as Kansas City’s seventh-round pick (No. 249 overall) in exchange for the 49ers’ picks at No. 37 (second round), No. 105 (fourth round) and No. 178 (sixth round).